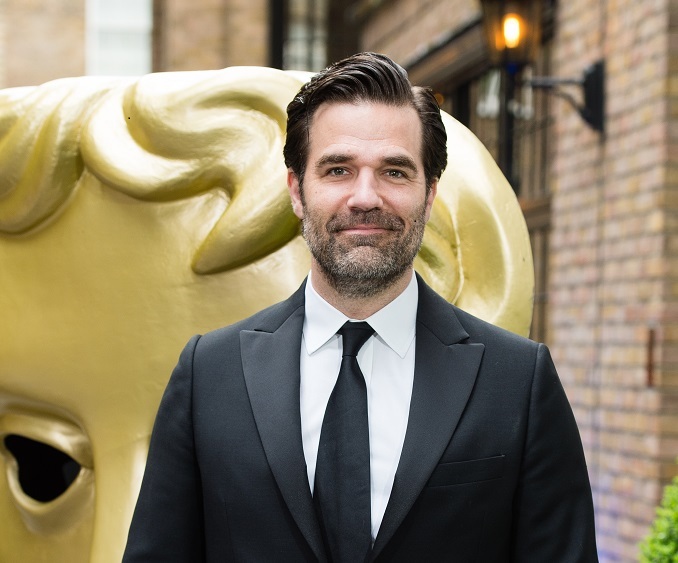 Rob Delaney, star of Catastrophe, revealed on Saturday that his wife, Leah, is pregnant. The couple's 2.5-year-old son Henry died five months ago after battling a brain tumor. He shared the announcement via a tweet, saying "Just had 2 typically wonderful @NHSEnglandLDN midwives visit my pregnant wife & I for a home birth assessment." Their son, Henry, had been diagnosed with a brain tumor in 2016. He had just turned one, but instead of growing, he was losing weight and faced persistent vomiting. He spent 15 months living in hospitals, but despite surgery to remove the tumor and further treatment, the cancer returned and he passed away in January. Delaney was certain to mention how much his son and family benefited from the national healthcare system in England. He said, "We didn't endure the financial stress of wondering are we going to be able to pay for this. Are we going to have to move during his treatment because we have to move in with relatives? And . . . what a gift." Rob and Leah have two other sons, born in the United States. He shared, "We had a couple of kids in the US and we had one child here in the UK and we're about to have another and now I know unfortunately that things can go very wrong and so I don't have the attitude like it won't happen to me because it did happen to us." He encouraged Americans to become active in the campaign for a better healthcare system, posting a video he made for Democratic Socialists for Medicare for All.